Size: 23 inches by 38 inches. 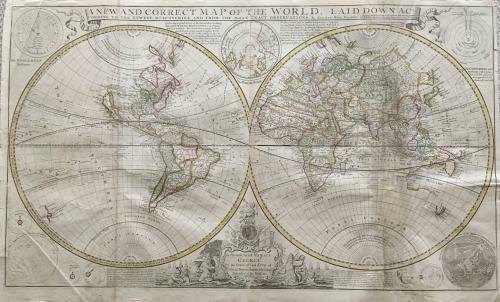 Title: A New and Correct Map of the World, Laid down According to the Newest Discoveries and from the most Exact Observations, published J.Bowles & Son, T.Bowles, R.Sayer and John King, circa 1730. A large engraved hemispherical map of the world depicting California as an island with inset projections of the North Pole and nine small celestial projections, contemporary outline coloring, old folds. Some minor margin paper repairs and a small amount of facsimile to replace loss at the fold in the area of Shark Bay, Australia. Overall in good condition on bright paper with original colour.